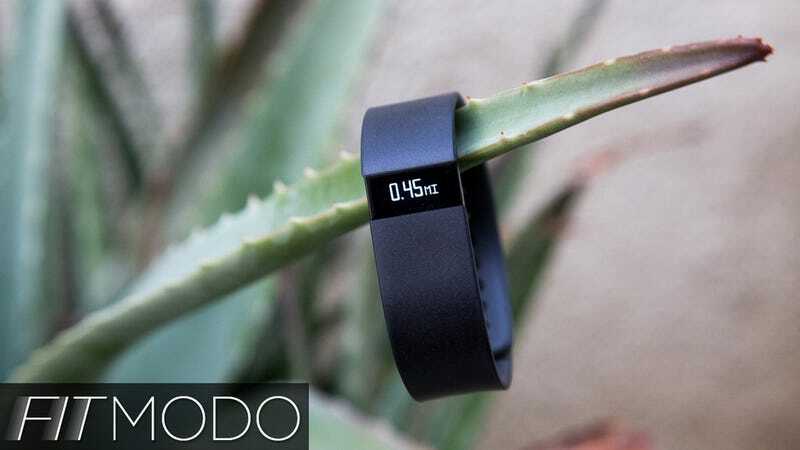 Last year, the Fitbit One was our favorite fitness tracker. It had a great design, solid accuracy for steps and floors climbed, and a nice screen. The only problem was that it was so easy to accidentally leave in a pair of pants. To combat this, the company created the Fitbit Flex, its first wrist-worn product. Unfortunately, while aping the Nike Fuelband, Fitbit accidentally threw out everything that made the One so great. Now, roughly six months after releasing the Flex, Fitbit has come out with the Force. It is, quite simply, everything the Flex should have been. It's a health tracker that measures your steps taken, floors climbed, time spent active, and the quality of your sleep. People who are trying to be more active and want some measurable data about their daily activities. Having even basic metrics about what you do throughout the day can paint a much clearer picture of your health, and may vary greatly from your perception of how active you are. The Fitbit Force will help you set goals, too. While it looks a lot like the Flex, but with a slightly wider band, the Force feels more high end. Unlike the Flex (which required you to pop out its brains every time you wanted to charge), the Force is one single piece of hardware. Its silicone band wraps around your wrist and snaps into itself easily. It's thin enough that it won't bother you while typing, unlike Samsung's much larger Galaxy Gear smartwatch. Up front is a bright, mono-color (cyan) LED display that clearly shows your metrics as you go. There is one single button on the left side which you use for waking up the display scrolling through the various screens. Subjectively, it's pretty good looking (the black version is, at least), and it wouldn't look out of place if you were dressed for business, whatever your business might actually be. It's really pretty brainless, which is nice. You use one button to flip through the time of day, your steps taken, your (estimated) distance traversed, your (estimated) calories burned, the number of floors you've climbed, and the amount of time you've been in a higher state of activity (like jogging). Hold down that button and it'll start a stopwatch, which is a handy feature. And that same button is also how you track your sleep at night (starting it when you hit the sheets, and stopping it when you wake up). All of that data is then wirelessly synced to the cloud. The smartphone apps let you sync your Force throughout the day, without even having to think about it, using the Bluetooth 4.0 Low Energy protocol. However, that also means it works only with iPhone 4S or above and only a handful of Android devices. Samsung's Galaxy line starting at the S3 works, for instance, and any Android device running 4.3 or higher should work, but most don't seem to yet (we tested using a 2013 Nexus 7 and couldn't get it to pair). But, even if your phone isn't compatible, you can still wirelessly sync via the included, tiny USB dongle. It automatically syncs from time to time when it's within 20 feet or so of your computer. Once your data is synced to the cloud, you can dig in and see a graphical analysis of your activity patterns, either on Fitbit.com or through the Fitbit apps. They're generally nicely laid out and they're easy to understand. This tracker gives you the most data for the least amount of having to think about it. It's comfortable enough to wear 24/7 and you don't have to worry about taking it out of your pocket every night, transferring it into a soft sleeve so that you can track your sleep, and then reversing the whole process in the morning. There's nothing really tragic here. But, because we have to pick something, we'll say that we wish it worked with more Android devices. 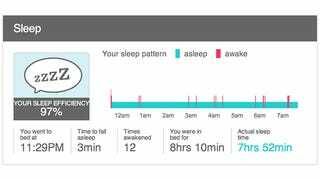 I'm not sure I totally trust the way it measures sleep patterns. You have two options to choose from: Normal, or Sensitive. In Sensitive mode, my sleep efficiency was always down between 48 and 56 percent. Horrible. I would be a total zombie if that were true. However, if I flip it into Normal mode, suddenly I'm a sleep guru with 96 to 98 percent efficiency. There is simply no way that either of those are accurate. While I suspect that Normal is more correct, the truth has got to lie somewhere in the middle. But where? With a gigantic spread like that it's impossible to know. Who should use Normal, who should use Sensitive, and why? We have no idea. Battery life on this thing is fantastic. Fitbit claims it will go ten days before needing a charge. We found that it went up to eleven. It only takes an hour or two to recharge, too. The Force is dubbed "water resistant," "splash proof," and "rain proof," but I decided to wear it during a 5K mud run anyway, because that seemed like a realistic use case. It was at one point under 2-3 feet of liquidy mud and was covered with sludge for the entire time. I thought I'd killed it for sure. But upon hosing it off, it was just fine, and it had been tracking all the while. Impressive. Unlike the Flex, the Force is extremely accurate. To test this, I counted my steps very carefully and would then check it against the Force. I counted a few hundred steps while walking normally, while walking with my hands in my pockets, and while jogging. In all cases, the Force was within just a few steps of what I counted. The Force has a silent alarm feature I really like (as did the One and the Flex). You set your alarm time either on Fitbit.com or within the app, sync the device, and go to bed. At the appointed time, the Force will silently vibrate on your wrist until you stop it, thus waking you up, but leaving your sweetie-pie in dreamland. In generally, Fitbit's site isn't quite as nicely laid-out or easy to navigate as the site (or apps) for the Withings Pulse. The Force has a wacky "coming soon" feature. When paired with iOS 7, you will be able to received incoming call notifications on your Force. It will vibrate and show the caller's name (if it's in your contacts) or number (if it isn't). This feature should be rolling out in the next month or two, unless they deep-six it. We're going with yes. While in some ways the above mentioned Withings Pulse is a better tracker (you can even periodically add heart-rate data), the Fitbit Force is simply the most convenient. It works really well, it's comfortable, it's accurate, and you won't have to dig through your hamper every morning trying to figure out which pocket you left it in. UPDATE: The Fitbit Force has currently been recalled due to a small number of people having a severe skin reaction to it. Bummer.